A Domestic Relations Order is issued by the court as an aid in dividing a couple’s assets during a divorce. Specifically, this order calls for the division of the typically most overlooked asset during divorce: retirement benefits. Because retirement is usually years away when a couple is facing a divorce, one’s retirement benefits may not be top of mind when dividing assets. Though commonly forgotten, a QDRO can be a crucial element to ensuring financial security after divorce. Q: What does QDRO stand for? Q: Who would need to file a QDRO? A: Like most other community property assets, the lower-earning spouse may be entitled to a portion of their ex’s retirement benefits after their marriage has ended. It is important to note, however, that the lower-earning spouse must issue a domestic relations order, and have it accepted by the retirement plan. Accepting a domestic relations order is what makes it a true QDRO. Without the “Q” (which stands for “qualified”) it is simply an order issued by the court for an individual seeking rights to their spouse’s benefits. Only once qualified will the receiving spouse (the alternate payee) be rightfully entitled to retirement benefits. Q: My spouse and I discussed retirement benefits in our settlement conference. Do I still need a QDRO? A: Yes. Even if retirement benefits were discussed in the couple’s settlement, federal law requires a QDRO before any retirement benefits are divided. Q: My divorce is complicated enough without discussing retirement which is many years off. Can’t I cross that bridge when I come to it? A: Yes and no. An individual is entitled to issue a QDRO long after a divorce is final. A QDRO can be issued before or after the ex spouse has already retired, and even after the ex spouse has passed away. However, it becomes much harder to have a QDRO accepted after the divorce is final. In some cases, having a division of retirement benefits outlined in the divorce decree can help expedite getting a QDRO accepted, but not always. If there’s nothing in the divorce decree regarding retirement benefits, then the only option is to reopen the divorce. This process can take years to complete. Q: My ex is already retired and receiving his benefits. If my QDRO is accepted, will my ex have to pay me half of what he’s already received? A: No, once a QDRO is issued, it only affects any future benefit payments. If no QDRO is in place when the participant enters retirement, then the participant will begin receiving payments as usual with no expectation to ever forfeit them. If a QDRO is issued and accepted at anytime thereafter, all future payments will be divided between the participant as well as the “alternate payee” (the ex spouse receiving a share of the benefits). Q: What if my ex is already sharing retirement benefits with another former spouse? Will my QDRO be denied? A: No, a QDRO cannot be denied simply on the basis of another QRDO being active on the plan. In a case where the participant goes through multiple divorces involving multiple QDROs, there will simply be more than one “alternate payee” that will receive a portion of the benefits. Q: What are the steps of filing for a QDRO? A: It helps to have an experienced family law attorney advise you in the process of filing a QDRO. 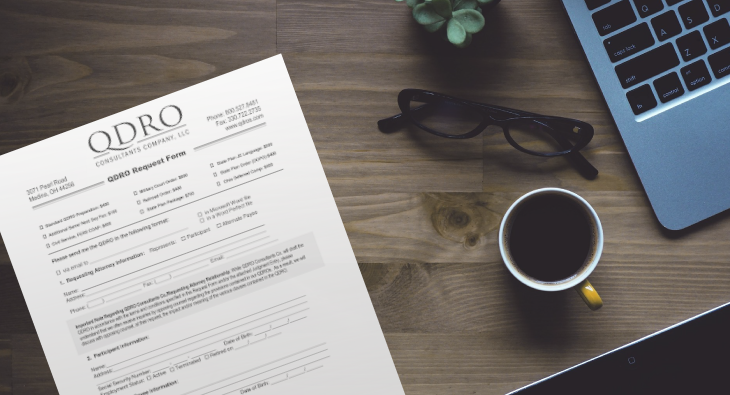 Your attorney will make your request for a QDRO either in a settlement conference or to the court, and ensure that your ex-spouse releases all information necessary to determine division of the benefits. Once your QDRO is ready, it will be submitted to the retirement plan for review before accepting. In the case that the QDRO is denied, the plan must include reasons for the rejection and revisions it will need in order to be accepted. If you feel you are entitled to a portion of your ex-spouse’s retirement benefits, LJ Law may be able to help. Contact our office at (702) 998-1199 or info@ljlawlv.com to set up a consultation to discuss your specific situation. For more information on QDROs or other topics regarding Divorce, check out our Family Law Playlist on our Youtube Channel.